Medical micro scalp pigmentation is a remarkable solution for men and women experiencing hair loss. 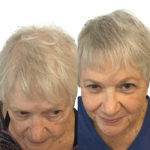 This non-invasive, painless procedure does not replace hair—it closely replicates the hair follicles on the scalp to help remaining hair appear fuller and thicker. 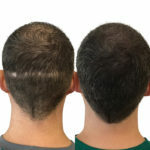 DiStefano Hair Restoration Center offers micro scalp pigmentation for patients throughout New England. 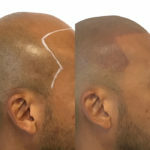 We routinely use medical micro pigmentation to treat men and women with alopecia. This procedure is effective for cases from the most minor to the most severe, restoring hairlines on all sides of the scalp. 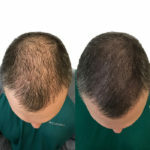 It offers impressive results for patients who are partially or fully bald, especially those who keep their hair closely cropped. It can also be used to darken the scalp of patients experiencing diffuse hair loss or thinning hair. Medical micro pigmentation is an ideal choice to hide scars from scalp injury or previous hair transplant surgery. It can also be used to hide birthmarks. At DiStefano Hair Restoration Center, our highly trained micro pigmentologist uses the most advanced techniques and only natural pigments. It takes a total of five custom colors to replicate a natural hair follicle on the typical patient. After the pigments are created, they’re placed in a cartridge and injected just under the skin simultaneously through five microscopic needles to create one “follicle.” By repeating this procedure in the same pattern as the patient’s natural follicles, the micro pigmentologist achieves very positive results. With five convenient locations, DiStefano Hair Restoration Center is the ideal choice for those in New England who have alopecia or other types of baldness and are considering micro scalp pigmentation. Call us today at 800-785-4247 for your free, private consultation with our doctors. You can also view our gallery to see some of the results that we’ve provided our patients.